The good news is that we are developing biological pathways to explain it all. dust mites are persuasive everywhere and this makes localizing its effect difficult. On top of all that, most dust is also heavily laden with various mold spores which also trigger allergic effects. My own book collection had become both dusty and hit with mold in the shelving. This made actual handling impossible for myself. I then applied a saturation ozone treatment. This had the effect of eliminating all allergic response. The ozone would attack both sources successfully. Do not try this unless you contact me. It requires special equipment. The point here is that we now know of at least one pathway. This does not eliminate mold but it is a good start.. Recognition of a new pathway may change the treatment of allergic diseases. Newswise — BIRMINGHAM, Ala. – University of Alabama at Birmingham researchers have found a previously unknown step in the pathway that leads to asthma, a discovery that may offer new therapeutic approaches to this incurable disease. 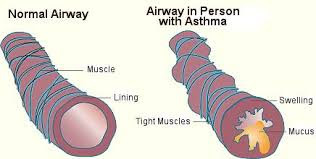 Asthma affects more than 25 million people in the United States, including about 7 million children. Experiments led by Beatriz León, Ph.D., assistant professor in UAB’s Department of Microbiology, used house dust mite (HDM) allergen and mice in their model system. The major finding by León and colleagues is that the first exposure to this common allergen — when inhaled into the lungs — leads to formation of memory immune cells that are assisted by B cells, without causing the classical allergic response of asthma. These long-lived cells, called T follicular helper cells, or Tfh cells, reside in the draining mediastinal lymph nodes of the lungs after that sensitization exposure. It is only when the mouse receives a later, second dose of the HDM allergen that the Tfh cells are induced to differentiate into a new type of T cell that will attack the allergen. Those cells, called type 2 helper T cells (Th2), migrate to the lung after the second challenge by HDM allergen. There, they recruit blood cells called eosinophils and launch the destructive asthma that makes breathing difficult, due to inflammation, mucus accumulation and narrowing of the lung airways. “This finding really changes the way we might think about treating allergic diseases and also has important implications when thinking about how young children are first exposed and sensitized to allergens,” said Frances Lund, Ph.D., professor and chair of the microbiology department and a co-author. The research is being published online ahead of print, in the journal Immunity, January 26. The details of the steps from sensitization to asthma are a complicated dance among several different types of immune cells. These steps require different cell types to touch one another as they trigger successive moves toward the ultimate immune response. These cells also release a variety of small proteins that act as signals to affect the behavior of other cells around them. • After the sensitizing dose of HDM, pulmonary dendritic cells in the lung carry the HDM antigen to the draining lymph node, where they prime naïve T cells through a cell-to-cell interaction in the interfollicular area of the lymph node. León likens the antigen-carrying dendritic cells to the teacher that tells the naïve T cells what to do to fight the allergen or a pathogen. • This reaction also requires antigen-carrying B cells to synergize the differentiation of the naïve T cells into Tfh memory cells, again through a cell-to-cell interaction. These activated B cells aid the long-term survival of these memory Tfh cells in the follicles of the lymph node. León likens the B cells to teacher’s assistants. The Tfh cells, she says, are now prepared and know what to do, but they are just waiting. • A second, challenge dose of HDM, again carried by the pulmonary dendritic cells from the lungs to the lymph nodes for a cell-to-cell interaction, induces the memory Tfh cells to differentiate into effector Th2 cells that home in to the lungs and recruit eosinophils. León likens the effector Th2 cells to fighters that attack the allergen or an infection. León and colleagues unraveled these complex interactions by separating and counting the different types of immune cells. In immunology research, the cell types are distinguished by the distinctive molecular markers on the cell surfaces that can be labeled with fluorescent antibodies. By following those markers, researchers can look for emergence of a new cell type that develops after a sensitization or challenge dose of HDM and also look for changes in where these cells are located. León and colleagues also used a grab bag of tricks to tease out the story of how HDM sensitization and challenge leads to asthma — transfer of sensitized or naïve immune cells from one mouse to another; use of various mutants that block a step of the immune response; reagents that selectively inactivate, inhibit or destroy a particular cell type; attachment of fluorescent markers onto proteins; measurement of intracellular cytokines; and use of bacterial artificial chromosomes in transgenic mice. First author on the paper, “T follicular helper cell plasticity shapes pathogenic T helper 2 cell-mediated immunity to inhaled house dust mite,” is André Ballesteros-Tato, Ph.D., assistant professor of medicine in the UAB Division of Clinical Immunology and Rheumatology, UAB Department of Medicine. Other co-authors are Troy Randall, Ph.D.; the J. Claude Bennett Professor of Medicine at UAB; and Rosanne Spolski, Ph.D., and Warren Leonard, M.D., both of the Laboratory of Molecular Immunology, National Heart, Lung and Blood Institute, Bethesda, Maryland. Known for its innovative and interdisciplinary approach to education at both the graduate and undergraduate levels, the University of Alabama at Birmingham is an internationally renowned research university and academic medical center and the state of Alabama’s largest employer, with some 23,000 employees and an economic impact exceeding $5 billion annually on the state. The five pillars of UAB’s mission include education, research, patient care, community service and economic development. UAB: Knowledge that will change your world. Learn more at www.uab.edu.